Filled with a curious hunger to fully understand our Thomas family, once again we come together to review and build upon prior efforts of telling our story. Some of us have seemingly clear paths through northern tier counties of North Carolina back to Virginia where records become fewer and therefore more difficult to link. There are others, like myself, whose only connection lies in DNA and the educated guess that somehow, we will someday clear a more perfect path into this family. 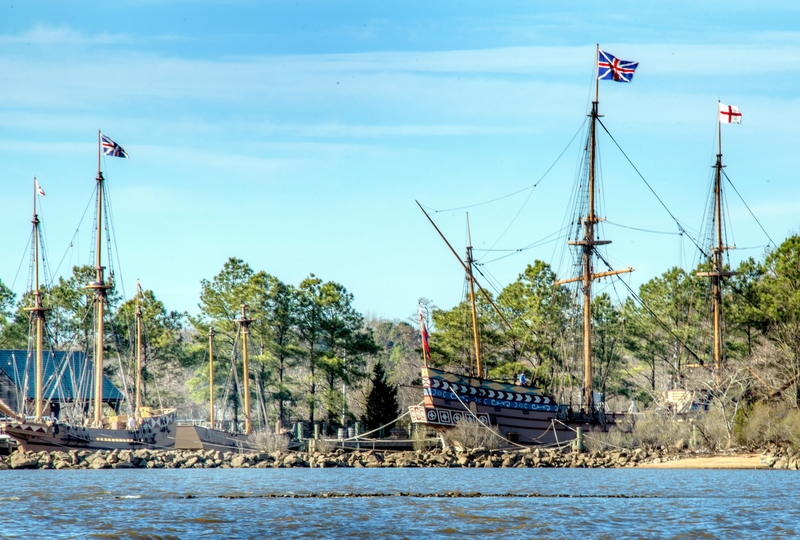 For us all, there is John Thomas who appears in 1620’s ship lists, a census/muster list, and a later land record near Jamestown VA. And, then there’s the story of Sea Venture, a storm, and Shakespeare’s “The Tempest.” Of all the possibilities, the connection to this place and time is nothing less than magical. It’s a great challenge! We’re talking John Rolfe and Pocahontas, the formative years prior to Colonial Williamsburg, the opening chapter of our American story. Much has been written about this earliest of American Thomas families. Published 1984, there’s Edison H. Thomas and his “Thomas and Bridges Story 1540 –1840.” And in 1977, Robert E Thomas wrote “The Thomas family in 300 years of American history.” There’s the writings of notable researchers like historian Hugh Buckner Johnston whose mother was Ruth Thomas born in Wilson County NC. And, there’s also indispensable research materials such as “Cavaliers and Pioneers. Abstracts of Virginia Land Patents and Grants” dealing specifically with records sourced in early Virginia. As we move forward, we’ll need to work with others in the family who have differing viewpoints. There will be differences with what was believed and written in the past. There will be disagreements both with the traditionally accepted story as well as among ourselves in deciphering the meaning of new finds. Yes, there will be new finds and new stories to tell. Some will merely add to the story while others may figuratively shake the ground from where we believed our beloved ancestors once lived. For many years I’ve looked towards Virginia with fear and an anxious internalized kicking and screaming of Noooooo….. don’t drag me there!!! It’s a big leap going back through records I have little knowledge. It expands the tree exponentially and with that is a much larger circle of information that’ll need to be verified. There’s much written on this stuff and until now (ha-ha), I was not part of the history. But things have changed, like myself, there is a growing crop of cousins who’ll be paying us a visit in the years to come. We’ll learn of each other through DNA and by improved understanding of the records. We’ll know each other and the story of each other’s family. So, if any THOMAS finds a kinship and is interested in learning more, please don’t be shy. Join us, share, and most importantly, participate in the painless Y DNA testing. We need more participants across the far-reaching spectrum of our Thomas family. This entry was posted in Benjamin Thomas of Anson NC, Bertie, North Hampton, Edgecombe NC, Early Virginia, Joseph Thomas of Wake, Chatham and Moore NC, Thomas and tagged Jamestown Thomas Family Viginia on March 9, 2017 by geothos. Misty, water-colored memories of the way we were, whoever we were. Great read. 1. This William Thomas was born 1791 in North Carolina according to the 1860 US Census. How did William wind up in DC/VA in the mid-1800s? Was Mary his daughter from an earlier marriage? He married Priscilla in 1843. Was this William in the War of 1812? These are some of.my questions. William disappears after 1870, and everyone is absent from the 1870 US Census although some reappear ten years later. Looking up these people is difficult! And, to think that they may have moved through in the mid-1600’s with some staying at that time in Virginia allowing numerous times of moving south or even back north across the line dependent upon what the times offered. Have any of the known lineage THOMAS males in your family been Y DNA tested? That’s the best thing you can do to see how a dead-end line may fit with others. Who cares if you’re half Irish setter, one quarter bulldog and one quarter poodle. What matters is who was your family’s ancestor!